← Graduate School Here I Come! In May of 2005, I launched my consulting practice. 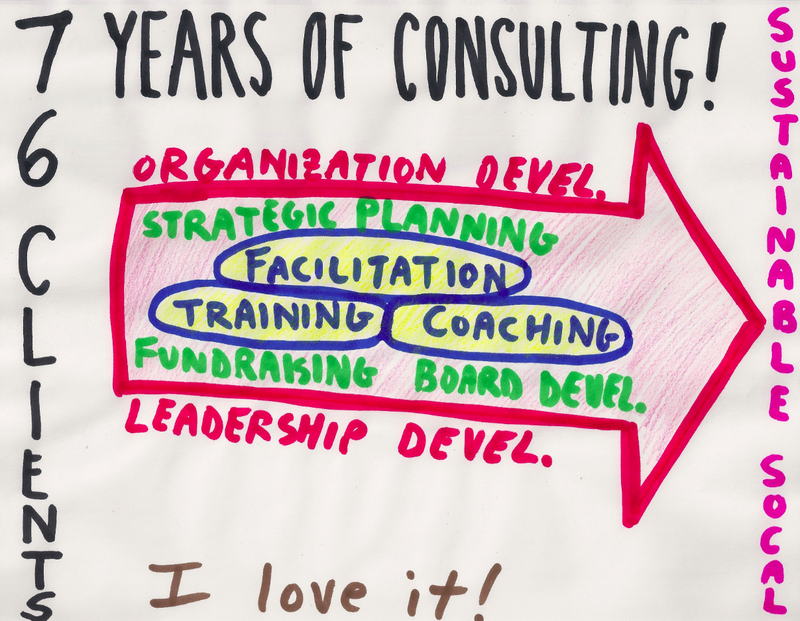 This month, I celebrate seven years consulting (having now served 76 organizations!). I launched my career in 1997 and its wild for me to think I now have 15 years of professional experience. Whether serving as a consultant, executive director or board member, I’m continually drawn to issues related to leadership and organization development. What’s your mission and vision and how will you make that a reality? How does your leadership reach consensus and how will you decide? How will you build a stronger Board of Directors? Who will support your organization and how will you build relationships with them? How do you manage a change process within an organization to change its culture? How do you build stronger teams, especially when personalities clash? How do you transform conflict and strengthen organizations? How do you promote an organizational culture of mutual learning? How do you effectively collaborate with a broader network of organizations? How do you evolve into a larger, more complex, effective and sustainable organization? These are some of the questions I plan to explore as I continue to build my own capacity as a consultant over the next seven years and beyond. I look forward to learning best practices and theories over the next two years as I work towards a Masters of Science in Organization Development at Pepperdine University. This graduate program is geared toward mid-career, working practitioners like me. During the program, I look forward to applying the best practices I learn in the classroom into the boardroom of organizations I serve. As I move forward, I hope to have the opportunity to build new relationships with a broader set of leaders like working on a variety of sustainability-related issues here in Southern California. I have witnessed so much positive change over the last 15 years and am optimistic about what is possible over the next 15 years. This entry was posted in Coaching, Facilitation, My Clients, Sustainability, Training and tagged #Nonprofit, Board Development, Coaching, Facilitation, Fundraising, Leadership, Leadership Development, Strategic Planning, Sustainability, Training. Bookmark the permalink. Thanks Deanna! Hope all is going well w/ you and your consulting practice as well.